experience within Drum & Bass through this next release. Having honed his craft, becoming one of the most prolific artists within the genre, his production standard ensured his position within its fabric. And now, over five consecutive sectors, he’s about to unleash a full colossal catalogue of work. Whether it be the new sonic masterpieces he’s worked over tirelessly, or the dubplates which have matured finely with age, it’s his most resounding output to date. Aptly named to demonstrate the time frame which his career has stretched over, the albums design is just as imaginatively calculated. The LP logo contains images of much of the musical equipment used to manufacture his signature style. Each release signifies a passing of time, every standalone sector which makes up the album features different mixers, speakers, samplers and other tools which reflect the different stages of his progression. to A Sides commitment to Drum & Bass. 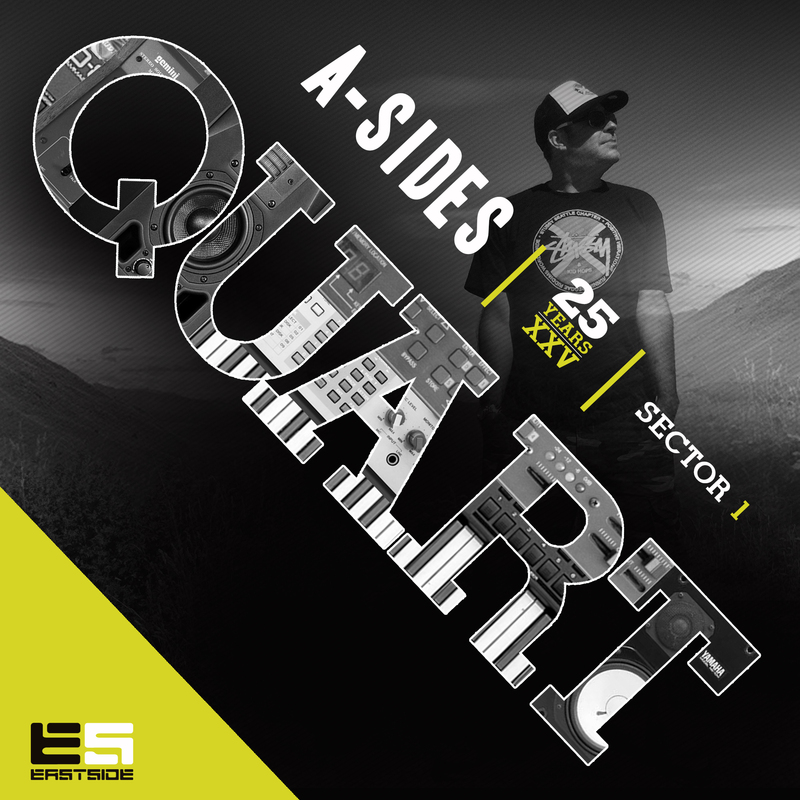 The first installment, ‘Quart Sector 1’, sets a precedent. Representing a quarter of a century, with many years to come, you’re instantly made aware of just how seminal this record really is. Your first introduction is to ‘Ultimate’, a blinding Old School, Amen riddim which is likely to be just as anthemic on the dancefloor. Snapping percussion and elevating bass stabs take you deeper into the mix, with disjointed, warbling sub growling between breaks. The perfect starter to a twenty-year journey. Fijoa Dub’ comes next, featuring the low-end vocal crow of MC Fats, whilst fluctuating beat patterns journey their way through peddled drum loops. The frantic tribalism of A Sides is immediately recognizable, whilst his classic etching within its composition proves his longevity. Heavyweight yet squeaky clean low frequencies take you deep into its core, adding a weight which is seldom seen within the genre’s newer recruits. ‘Stone Crusher’ marks the EP’s middle, this one is pure dubwise with echoing horns pulling you into a foreboding intro. Percussive samples dice each segment, with a low rolling bass and Reggae vocal elements floating between layers. Jungle-esque pounding adds to its stockier elements, nodding to the past whilst divulging a more contemporary era. Next up, ‘Tokiado Revision’ presents something vastly different. Creeping in its depth, built up coatings and rattling symbols keep it driving forward. Phantom like but still holding the aggression undertaken by its steely drums, you’re exposed to A Sides refinement. He’s able to master the art of constructing a record that is as subtle as it is heavy hitting, indicating his vast production capabilities, garnered through years of graft. And finally, ‘Voices’ ties together both ends of the EP, showcasing the talent of Rotterdam based vocalist Aletta. A smoother ride than the other four tracks, Aletta’s smooth vocals are utilized to pad out its plucking strings and clinking hi-hats. Softly spoken, delicately drawn out and peppered with flute notes, it’s a climax for the full EP. Sure to be a sleeper favorite, yet again it displays A Sides breaking out of the paradigm artists can sometimes become confined to. If this collection of music is anything to go by, A Sides is about to unleash a monumental project for not just his own career, but for the industry as a whole. Having already solidified his position over twenty five years, this release is about to become ingrained inside the genre’s history books. Although, after years of engineering, that’s all to be expected from an artist like A Sides. Čeprav ima koren v arabski besedi sawda, ki označuje črni žolč ali melanholijo, je sevdah, po turško sevda, predvsem – ljubezen. In Ljubljana do sevdaha goji pristno ljubezen. Slednja bo samo še večja po težko pričakovanem nastopu zasedbe Damir Imamović Sevdah Takht, ki bo sledila izdaji plošče Dvojka v založbi tukajšnje mednarodno delujoče založbe Glitterbeat. Po samostojnem nastopu in tedaj še tričlanskem Takhtu na mednarodnem festivalu Druga godba se bo Damir Imamović tokrat v okviru ciklusa Sogodbe pri nas premierno predstavil z okrepljeno zasedbo: poleg tolkalista Nenada Kovačića, katerega zahodnoafriški vplivi so pravo darilo sevdahu, in Ivana Mihajlovića, istočasno razigranega in smrtno resnega basista, bo v njej tudi odlična sarajevska violinistka Ivana Đurić. Kajpak pa Damir ne bi bil Damir, če ne bi raziskoval tudi sam pri sebi, zato svojega vse bolj žlahtnega glasu, ki se mu že prej ni bilo treba sramovati dediščine slovitega deda Zaima, ne spremlja več s kitaro, pač pa s tamburjem, nekakšnim prav po njegovih navodilih narejenim unikatnim križancem med sodobno kitaro in tradicionalnim inštrumentom sazom. Čuvaji umišljenih tradicij, ki bi sevdah kot žanr najraje zreducirali na zaprt sklop konvencij sloga, ritma in repertoarja ter na ta način skozi sevdah ustvarjali odraz nacionalnega karakterja, so ob Sevdah Takhtu in albumu Dvojka kajpak dvigali namrščene obrvi, saj Imamovićeva umetnost ni nič drugega kot tihi upor znotraj sevdaha, je globoko premišljeno delo, ki se izogiba zapeljivemu nacionalizmu. 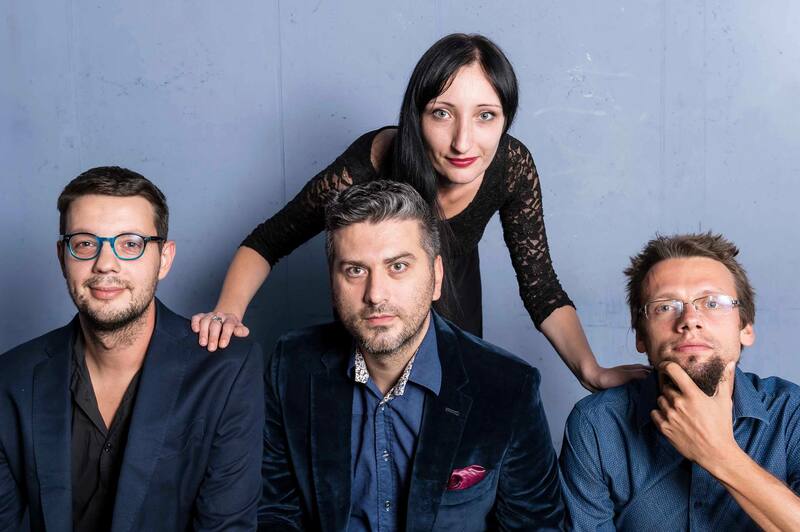 To glasbo Imamović iz svojega rojstnega Sarajeva, ki ga boste skozi uvodno pesem albuma Dvojka spoznali v povsem drugačni luči kot skozi številne kičaste hvalnice, prenaša v glasbeni svet, ki je poln hvale tako na njegov račun kot na račun Sevdah Takhta in albuma Dvojka. Music producer & multi-instrumentalist from Zagreb, Croatia. Tracks played in countless mixes from all over the world, supported on major radio stations like BBC Radio 1, BBC Radio 1xtra, BBC Radio 6, SubFM, RinseFM, Ministry of Sound, Solomonic Radio etc. Releasing vinyl records on Lion Charge (UK) , ZamZam (US) ,Lo Dubs (US).